I haven’t posted a breakfast or brunch recipe in a long time so I took inspiration from what I like to do at night to create almost a hangover meal for you! So what do I like to do? Not waste any leftovers and wine, obviously! So if you’re wondering what you can do with that last glass of wine left in an open bottle, those few bites of fruit and cheese, and opened bag of nuts from hosting a party then I have the perfect solution for you! Make a pancake. 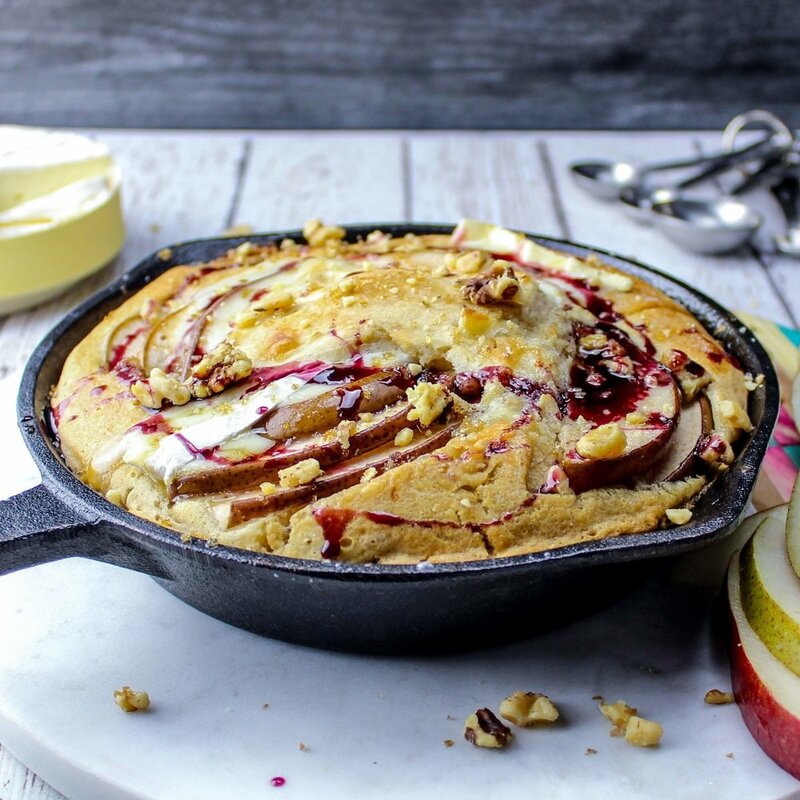 Yep, just one….big…skillet pancake! Or what is also called a Dutch baby. So much easier than making individual pancakes, and you can throw in a ton of ingredients that bake right into the batter. Yummm! Pears are perfect for this because they are naturally sweet, pair so well with cheese, wine, and nuts plus have a great texture after baking. This Dutch baby pancake is sweet, savory, nutty, and fluffy and I think you will love it. After your batter comes together add cubed brie cheese, and set aside. Heat an 8 or 9 inch cast iron skillet. When hot place butter and brown sugar in the skillet. Let the butter melt and come together with the sugar then add the walnuts. Caramelize walnuts for about 30 seconds on medium heat then add the pears. 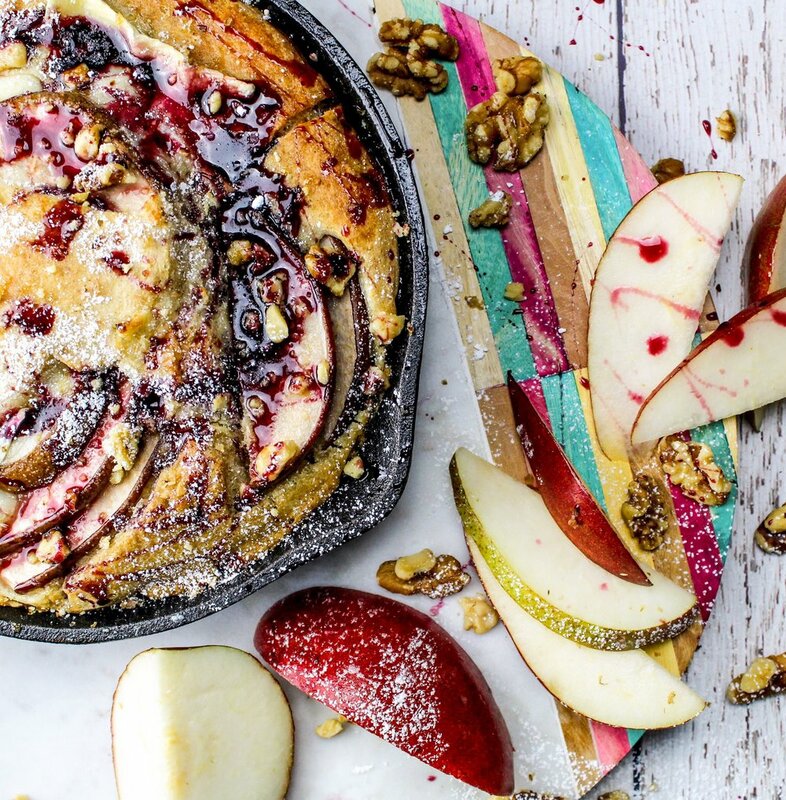 If your pan is overflowing with pears save a few slices to place on the top of the batter. Mix pears and nuts so everything is coated with brown sugar and butter mixture then turn off the heat. Pour the batter into the skillet and carefully place skillet into the preheated oven. Bake for 20 minutes until pancake is cooked through and brown on top. Top with more butter if desired, toasted walnuts, mulled wine syrup, and powdered sugar. A huge thank you to USA Pears for partnering with me on this post! Head over to their website to learn more about pear varieties, peak seasons, growing regions in the United States, and of course more pear recipes!